Can You Rule Riddler Nation? Welcome to The Riddler. Every week, I offer up problems related to the things we hold dear around here: math, logic and probability. There are two types: Riddler Express for those of you who want something bite-sized and Riddler Classic for those of you in the slow-puzzle movement. Submit an answer for either,1 and you may get a shoutout in next week’s column. If you need a hint, you can try asking me nicely on Twitter. Submit a whole number between 1 and 1,000,000,000. I’ll then take all those numbers and find the average submission. Whoever submits the number closest to ⅔ of the mean of all of the submitted numbers wins. Suggested by Joel Baker, a very special Riddler Nation battle royale! Congratulations to 👏 Stephen Carrier 👏 of Berkeley, California, winner of last week’s Express puzzle! In the game Tetris, if you’re lucky, you can clear the board after the first five pieces are placed. Knowing that, how many arrangements of Tetris pieces are there that form a solid block that’s two squares high by 10 squares wide? A number of intrepid solvers also noticed a lovely pattern. The number of ways to fill a two-by-two, two-by-four, two-by-six, two-by-eight, and so forth, empty space with Tetris pieces is equal to the Fibonacci numbers squared: 1, 4, 9, 25, 64, 169, and so on. For a fantastic discussion of this pattern and Tetris math, check out this document from solver and “former Tetris addict” Samuel Wirajaya. Math is cool. Congratulations to 👏 Alex Szatmary 👏 of Lewisburg, Pennsylvania, winner of last week’s Classic puzzle! At the beginning of time, there is a single microorganism. Every day, a member of its species either splits into two copies of itself or dies. If the probability of multiplication is p, what are the chances that this species goes extinct? Solving that for q, we get two solutions: q = (1/p) – 1 and q = 1. The former is a well-defined probability (that is, it’s between 0 and 1) only as long as p > ½. 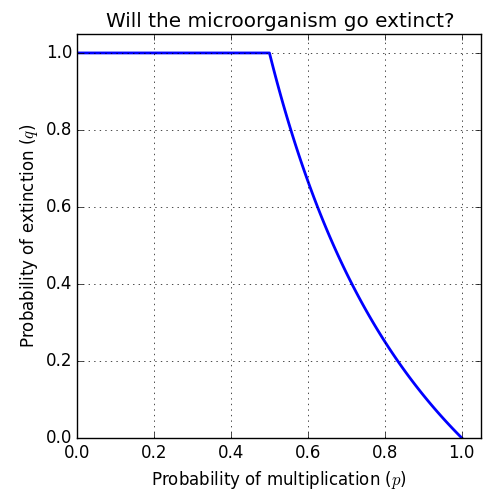 If p ≤ ½, we know the probability of extinction is 1. Good luck out there, little guy. Important small print: To be eligible, I need to receive your answer before 11:59 p.m. EST on Sunday. Have a great weekend!